Miller Roofing Contractors, a Conklin independent business owner, is a central Ohio metal roof restoration professional. We specialize in commercial repair, restoration, and installation of metal, flat, and EPDM roofs. We have been a commercial roofing contractor in central Ohio since 1987. Conklin’s Metal Roof Restoration System is a complete waterproofing system for metal roofs. It ceases all water leaks, inhibits all rust, and provides an energy efficient, durable, long-lasting, attractive finish coat, which will extend the life of your metal roof for years. During the restoration process, we will clean the entire roof with Rust Off, then prime it with Conklin’s rust inhibiting primer, Metal Ready Universal. Once we have reinforced all of the seams and fasteners, the entire roof is coated with a highly reflective coat. 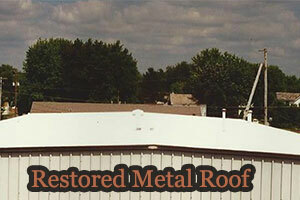 At Miller Roofing Contractors, we know making a metal roof restoration can be a big decision. We will gladly sit down with you to go over the Metal Roof Restoration System and see if it would be the best choice for you. With Conklin’s 40+ years of technology and our 27 years of roofing experience, you are in good hands with Miller Roofing Contractors – your #1 central Ohio metal roof restoration experts. If you need a central Ohio metal roof restoration, call on the professional commercial roofers of Miller Roofing Contractors at (740)404-3390 today. We’ll answer any questions you have or advise you on the best choice of roof for your specific needs. We look forward to hearing from you! This entry was posted in Central Ohio, Metal Roof Restoration. Bookmark the permalink. Follow any comments here with the RSS feed for this post. Both comments and trackbacks are currently closed.